All of the newest, upcoming Power Rangers toys have been revealed at New York Comic Con, and they look great. With Power Rangers Ninja Steel getting closer to Super Ninja Steel, Bandai America have taken this opportunity to unveil some of their upcoming releases. From standard Deluxe toys to Legacy Line, there’s plenty to feed your desire demons. First, we’ve got our first look at the ‘Blaze Megazord’, Super Ninja Steel’s version of the Gekiatsu Dai-Oh! Looking almost identical to its Japanese counterpart, the Blaze Megazord definitely looks the part. Maintaining the 6 coloured Rangers in the chest for what we can only assume is a dart-firing action, this toy will be a must-buy if the Gekiatsu Dai-Oh is out of your price range. We also get a nice look at the accompanying Super Ninja Steel figures and weapon with summoning star. These heavily armoured figures have taken Ninja Master Mode to a whole new level, with a nice gold accent. The Deluxe Blade Bow also sparks some interest, as it’s a sword that springs open into a bow! Double the fun, double the trouble for kids hitting their friends over the head by accident. The included summoning star is just as unflattering as all the Ninja Steel stars, so if anything you’ll only be buying that set for the Power Rangers exclusive original weapon. Shocker! We get a great look at the upcoming Legacy Toys too, and oh boy there’s a lot to see. 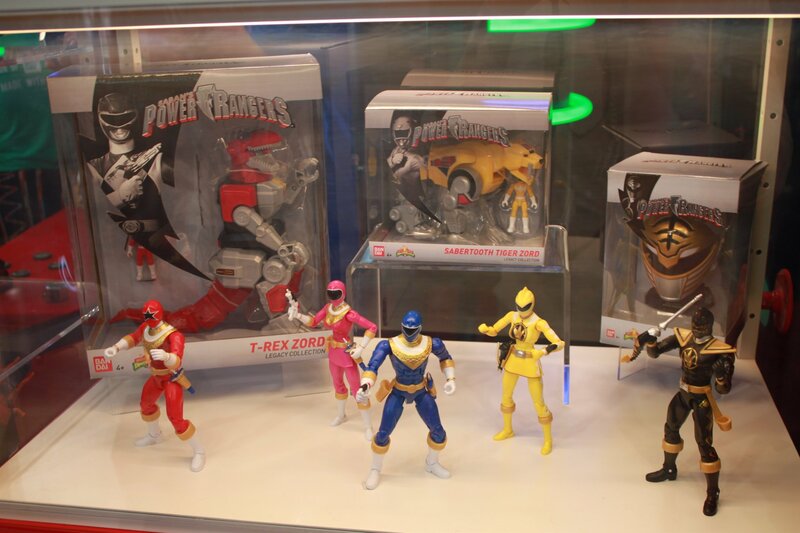 Zeo Red, Zeo Pink, Zeo Blue, Dino Thunder Yellow and Dino Thunder Black all looking as great as expected. The Dino Thunder Black figure will be a must-have with the Exclusive Tommy Figure set coming soon, as Dino Thunder Black will not be included in that set. In the back of that picture you may have noticed some new items as well. Introducing the ‘Legacy Mini Helmet ‘ line. A great item for any collector, these helmets will be too small to wear, but will fit comfortably on even the smallest shelf. (They’ll be a lot more affordable too). Here’s hoping we see this line release helmets for rangers other than MMPR! Lastly, we see the Legacy Zords. These zords are an individual release of non-combining MMPR zords. Great for displays, these zords will be better articulated than the existing Deluxe and Legacy Zords. Designed to pose in action scenes, or simply play with, this line will be great if you don’t want your children to choke on the small parts that are normally included with other releases. What Legacy Zords and Mini Helmets would you like to see released? Let us know in the comments or on the Toku Toy Store Facebook and Twitter pages!